If the constantly-repeated tweet "we are the 99%" is true... then make it so. You are not alone. You are young, yes; you might think we were never young either, but we were. You might think you are all together in this, but you are not; there are 20somethings toiling away in the Wall Street offices, new baby Masters of the Universe. You seem to think "the older generation" is all together in the pockets of the wealthy; we are not. Many of us have been involved in actions similar to yours over the last 30 years, like the Democratic National Convention in Los Angeles, where I took a rubber bullet, got gassed and barely avoided my leg being broken by a charging police horse like the girl I was standing next to did because she wasn't as fast as me and fell the wrong way. 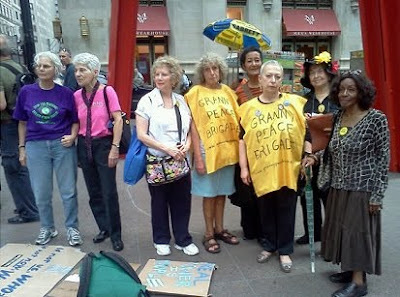 There have been "old people" in recent protests in Switzerland, Philadelphia, Spain, Egypt and Syria. We know what we are getting into; we have no illusions about the methods that can and have been applied against us. We continue to go anyway. Many of us bear the scars, both physical and mental, of these experiences. Many of us are not "privileged' even if we were born into that caste; we have rejected it, as you are doing now. Perhaps you have met with scorn from older people in your life. Perhaps some have expressed disdain or condescention for what they have seen as a listless generation, amused to death by corporate toys, ignoring both their own personal history and the history of this country. Perhaps they have reason to feel this way; look around at your whole generation and tell me, are you all of one mind? Are you all of the same spirit I see in these protests? If you are honest, you will admit it is not so, just as it's not so for the older generations. It's always been this way. In every generation, there is a vanguard that looks beyond its own selfish preoccupations to the world at large; to their fellow man (and woman) and feels the righteous indignation, the anger and the despair of a rigged and fixed system in which people are pawns and machine pieces to be used and discarded. One of the things learned at the hard cost of blood, injuries that will never heal or go away and disillusionment is that you cannot be separatist; that is the way the enemy uses to undermine you. Many of you are quoting great men of past generations: Gandhi, JFK, Martin Luther King. These were not young men. Some even came from position of privilege. Yet they rejected that status because thier minds and hearts were open. They embraced both young and old, even when their peers were trying to discredit youth. Please do not make this mistake; it will weaken you. There are many Americans, people of good consciousness and soul, that will support you. I have been doing what I can from where I am. My position is clear from this blog and from my writings; it is in harmony with your own. I use my knowledge of watching the media for +25 years to investigate alternatives; to promote the understanding that the nets are the Last Free Press and can be the wedge that cracks many problems wide open. I see this tweeted over and over: "is there a media blackout? We need media here!" What media are you talking about? I've tweeted a few comments that might seem humorous unless you actually think about them. Do you think the media was quick on the story during Vietnam? During the recent protests in Canada and Philadelphia? Do you think you ever saw on the nightly corporate media channels the videos you can see on You Tube of protesters being cracked, gassed, bloodied, hauled across concrete on their faces? No; you didn't and you won't. From where I sit, I see no media blackout. No... I don't see this story on MSNBC, CBS, BBC... but I see it all over on Twitter, on blogs, on alternative press, Flickr and You Tube. The only "media blackout" I see was on the sell-soap media channels, and I never watch them anyway. Because they are full of shite. Forget the goddamned media cartels! Use your own media; the New Media; the media strong enough to route around obstructions and blockages that finds or makes new channels for the distribution of information. Take my word for it: if you keep the information out there and building, the Lamestream Media will come after it in search of their own bread and butter. That's the way they work; they cannot afford to ignore the story if you keep getting the story out despite their blockages and the story gets bigger. Please remember that many of us "oldsters" have built the platforms over the last 25 years that you are using right now to get your message and story out. We believe in the net... and many of us believe in you. Don't fall into the ancient trap of divide and conquer. Don't alienate or turn away anyone who is sincere. Their heart is in the same place as yours. Some of them have experience in the same kinds of actions you are taking now and can offer tips and tricks that can help you stay alive, stay together and speak coherently to power. There's a lot of anger and frustration and resistance out there; you may not see it but I do. It is not confined to one generation. Some of us cannot be there, but we have been before, and we help from our position. We send food and water; we offer hope and encouragement; we offer insight into police tactics, media tactics and politics from 30-50 or more years of observation and testing. Some of us are out there right now with you, protesting. Don't turn away the grannies; they may have fought in the streets for you before you were born. Don't ignore the workers of Wall Street; the bakers, the cooks, the janitors, the secretaries; many of them are as oppressed as you are, caught in economic chains having to support their children - the very children who are your generation. Don't ignore the good cops; learn to see and separate them by their eyes and hearts from "the pigs." Many a policeman has laid down his gun in the face of orders telling him to wield it; at Kent State, Army personnel faced court-martial and loss of all freedom for following their conscience and refusing to fire on unarmed protesters. Many a policeman of good conscience has looked the other way during protests and allowed demonstrators to slip the noose of departmental maneuvers. Look for these people; they are the same as you, despite differences of race, color, creed, economic position or age. Don't be the people you protest about; don't reject honest hearts and minds because of some stupid and irrelevant criteria as age of body; you will get old soon enough. Will your heart change then? If you really speak for the American people as you claim (and which I believe in your hearts you do), please accept good people's aid wherever you find it. We cannot do this alone; we need to band together as the voice of the People if we hope to win on these issues. "Former Secretary of Defense Donald Rumsfeld has been stripped of legal immunity for acts of torture against US citizens authorized while he was in office." The first step in a chain to ultimately make this man responsible for the horrendous breaches of both law and humanity he was ultimately responsible for over the last 10 years and which has devastated both our own morale and the international community's good will towards us. Senators Ron Wyden and Mark Udall keep pressing the Feds about the secret interpretation of the U.S.A. P.A.T.R.I.O.T. Act [Uniting (and) Strengthening America (by) Providing Appropriate Tools Required (to) Intercept (and) Obstruct Terrorism Act of 2001] that go far beyond what the public or cartel media has reported on. Here's the actual letter. Finally, here's a post I really like and that has great wisdom: Investigative Creativity: ATTENTION THERE IS DANGER! If you decouple the collusion between the holders of your money and the gamblers using that money, not their own, to play high-risk and high-speed gambling games, risking nothing because it is not their money but your own that is being risked, you will have made a huge step towards dismantling the obscenity that has devastated the American economy. You will also have gained a respected voice, a solid position and some experience from which to tackle the myriad other problems that remain. However, this one act could change many things; I urge you to understand what the Glass-Steagall Act was; how it was suborned by corporate interests and why it is a large part of the problem we have now in the investment community and the state of the economy. Lastly... to the members of my own and previous generations who have never given in; who have waited for moments like this all their lives: gear up! These kids need our help.